"A one-skillet dish that makes a wonderful side or meal in itself." Melt butter in a large skillet over medium-high heat. 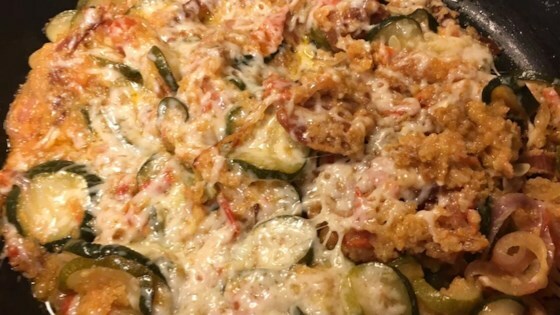 Mix in zucchini, onion, tomatoes, and bacon. Season with salt and pepper, and pour in water. Cover, and cook 10 minutes, stirring occasionally, until vegetables are tender. Stir the bread crumbs and soy sauce into the skillet, and mix in Cheddar cheese. Cover, and continue cooking 2 minutes, until cheese is melted. Sprinkle with Parmesan cheese to serve. this recipe is awesome, i added a little garlic and left out the bacon. it is the perfect vegitarian meal, i also added some yellow squash and a little garlic salt as well.